Based in Ely near Cambridge, K3 are one of East Anglia's leading show home interior designers and furniture rental companies offering a professional, personal show home staging service tailored to property developers, landlords, private vendors and investors. At the helm of K3 Showhomes is Karen Kerridge and Fiona Sandland, two talented and innovative interior designers who have built up a leading show home design and furniture rental business. Based in the cathedral city of Ely, near Cambridge, they have created a loyal client base which stretches across East Anglia and beyond. K3's rise to success has not only been based upon the quality and creativity of their show home design, but the high standard and 'hands on' approach to every stage of a project. Clients come back time and time again because they know that they can rely on K3 to be flexible, on schedule and yet keep to an agreed budget. 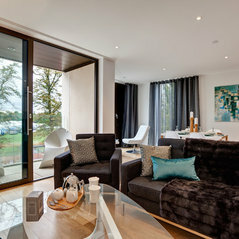 Unlike a lot of other show home designers K3 offer you the choice of renting or buying the entire showhome contents, in fact everything from the sofa and beds to the linen, rugs, artwork, faux TV’s, lamps and all important colour co-ordinated accessories.